The case for relocalizing our food system. Bicycles never used to be thought of as central to the food system, but the Internet has allowed this particular wheel to be reinvented as a prime tool for localizing food systems while reducing traffic jams, cutting global warming emissions, and providing jobs. This innovation comes to light on account of Uber’s recent decision to reduce the fee it provides to UberEats bicycle couriers who are paid for deliveries on a per-ride basis, much as if they were cabbies. 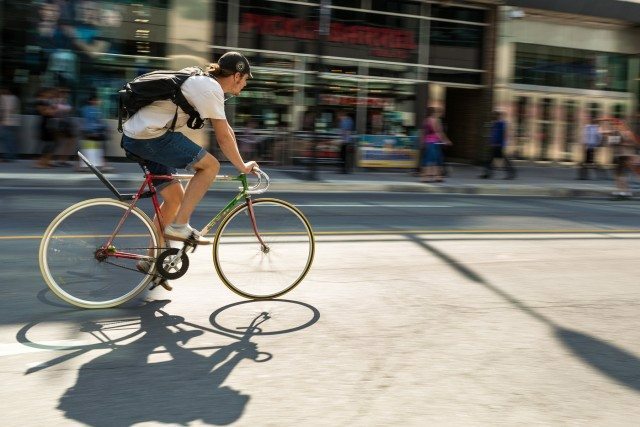 What amounts to a reduction in the amount delivery people make for each trip has got the riders quite upset, according to the Toronto Star. The controversy indicates how vulnerable members of the precariat are to shifts in the terms of their contract. But there’s another issue that got revealed here, which is the transportation system best suited to strong neighbourhoods and a vibrant and resilient food system. Bringing coffee, the second most traded commodity in the world (after oil), from Ethiopia or Colombia to Toronto is no longer a big deal in the food logistics industry. It’s all handled by cranes and boxcars that move very swiftly on sea lanes, railways, and super-highways. The trip that’s a real killer from a space, energy, and hassle point of view—even worse than the short trip from the local warehouse to the local retailer—is the brief car trip from the customer’s residence to the retailer and then back home again. The longest and worst mile per unit of weight, energy, air pollution, clogged road space—you name it—is the last one that the consumer makes. Those trips add up. It’s commonly estimated that one in five car trips in a city is to do food shopping. If you want to calculate the embodied energy involved in moving food, the energy to move a two-ton car four miles to bring back 10 pounds of groceries is by far the most polluting trip any grocery item from anywhere has ever been on. Resolving that problem with cycling couriers takes a lot of cars, a lot of traffic jams, and a lot of fuel emissions off the road. We can park a lot of problems if we manage food pick-up and delivery with the clean, renewable human energy of cyclists and walkers. Being of a certain age, and having grown up before people automatically assume there is an electronic app that can solve every problem, I spent a lot of my career in food policy encouraging planners to reinvent the neighbourhood main street, so that the last mile could be reduced to a few blocks and become a walkable trip. Putting food stores and restaurants back on main streets that are walking distance from densely populated neighbourhoods could be good for many reasons: good for fitness, getting to know neighbours, and building neighbourhood cohesion, which in turn is good for child safety and local response to emergencies. To give Uber its due, the idea that the Internet could solve the last-mile problem by providing a virtual electronic highway that displaces short car trips never occurred to me, or the many city officials who told me to get lost. Computer networks intervene at the very point when big vehicles become the least efficient way to move food, and bicycles become the most efficient way. That’s a mini-revolution in food logistics. We need to find a way to thank Mr. Uber for this. Perhaps someone could name a bicycle trail in the company’s honour. Or better still, a bike delivery co-op, which might perhaps be named Uber My Dead Body. But a global corporation should not be allowed to take 35 per cent of the fee for the delivery, or have the monopoly on how to turn this application of the Internet, and all the publicly funded airwaves and bike lanes that make it viable, to its exclusive control and profit. Bicycle couriering of food has the potential to be a service that is loaded with public benefits. It makes it possible to end the mess of problems caused by the 1950s mistake that still lingers on—allowing supermarkets to be placed just far enough away from their customers’ place of residence to require a car trip, with a catchment area that allowed supermarkets to do bulk-buying on behalf of customers from several neighbourhoods, and thereby squeeze out main-street retailers who were a walk away from home. 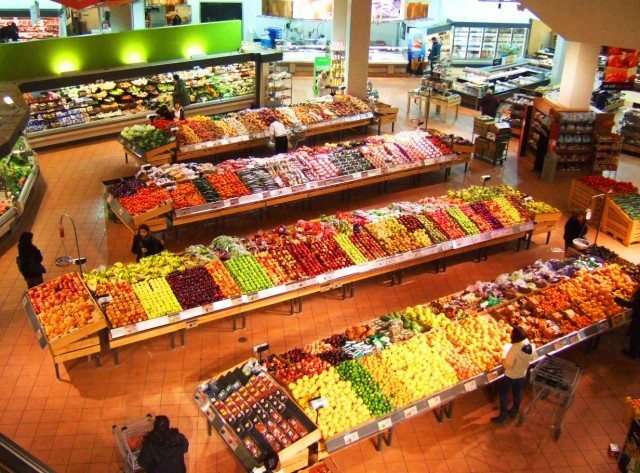 A supermarket’s produce section. Photo by kaeko from the Torontoist Flickr Pool. That’s the “efficiency” that gave supermarkets control over city food sales, and led to an explosion of supermarkets in plazas and malls during the 1950s and ‘60s, creating a crisis for mom-and-pop businesses on main streets. Fast food retailers repeated the formula during the 1960s and ‘70s, which is why they’re also located away from neighbourhood-based main streets, and in no-man’s-land areas where there are seas of free parking accessible to neighbors from all directions, thereby gaining access to a mass of customers who can be wooed with lower prices for standardized food. The good old city planners who allowed this transformation in the location of food outlets made car trips essential to buying groceries and getting a restaurant or take-out meal. Now that half of all meals are eaten outside the home, and many trips to the supermarket are no longer a weekly outing for the family but a grab-and-go for a few days’ snacks, there’s been an explosion in car use within the city. Incredible contradiction: the efficiency of the city is that it brings many people in close contact with many services and personal relationships, but transportation and mall planners totally undermined that by distancing food shopping from residential neighbourhoods. The city was made for walking and cycling, but the placement of supermarkets and low-cost food take-outs outside of neighbourhoods’ reach made routine trips dependent on cars. City food systems became fossil fuel-dependent. And the extra car traffic accounts for traffic jams that cost a city like Toronto over $6 billion a year in time wasted driving one mile per hour, about a third of the speed of a walker and a tenth of the speed of a cyclist—both of whom leave the air pure, while making themselves fit. Huge amounts of civic space are also eaten up by cars, since most cities devote a third of their space to pavement oriented for cars. Giving cars this monopoly of space makes it virtually impossible to allocate sufficient space for gardens and greenhouses that could grow food for cities literally in neighbourhood backyards. Sigh. All these externalized costs that no one ever thought to watch for when cities were designed for cars. With a little bit of uberhaul, we can convert electronically dispensed bike trips through a co-op, which ensures that cyclists are paid a wage that gets them through school, or started on a new and creative career, which we very much need in cities dependent on the knowledge economy. And that can be done by organizing a co-op for cyclists, or rather a series of co-ops for each area of the city, as we relocalize the food system, both in terms of bringing it close to where people live and in terms of optimizing the number of decent and secure jobs providing food. To be resilient, cities need to localize as many services as possible to make them independent of outside control when it comes to the basics of life. Getting access to food is one of the basics, and the means of doing that should be as localized as the food and companies that get it customer-ready. The last mile needs to be in the hands of the people who live there. Wayne Roberts did bicycle deliveries for Joe Caruso’s in Scarborough from Grade 7 to 12. He now edits a newsletter on food and cities.